Does anyone else kind of explore through Google to see where it leads? I will be in Hamilton on Friday, Boxing Day, and hope to get out for an hour looking for relics of old trucking companies. I started by finding, on the main Website, a reference to Woodward Avenue. On a recent trip there I saw some old buildings that looked like they had been trucking terminals. I think one might have been Kingsway's terminal. 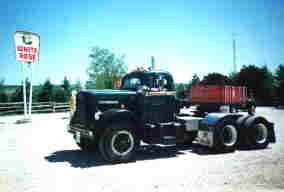 Hansen Transport was taken over by Canadian Freightways which was owned by CONSOLIDATED Freightways. They list 401 Woodward as the terminal location. I don't think that's the one I saw. Then I found a reference to a framed 1973 calendar from Walmer Transport on Ebay ( or a car club). So I followed that and saw the picture of the calendar. That showed that carrier's address as Lottridge Street. It showed a picture of an "N" Model Ford truck too. I found a reference to an employee prepared corporate history of Canadian Canners Ltd. There I found a brief history of Walmer that it had been formed in 1939 as the In House carrier for Canadian Canners and it was sold to Network Transport in 1983. So, I now have a capsule history of a carrier, Walmer, but still wonder who used to be on Woodward Ave. I'll keep digging and add to this thread as I get more information. Canadian Freightways terminal on Woodward has been torn down, long ago. It's now the site of one of the big box stores - memory is blank right now but I think it's a Home Depot. On Parkdale, the U-Haul building was formerly the factory branch of White Trucks. If it's still there. If you wander down Burlington Street towards the yacht club, the yacht club itself occupies the former facilities on Guise Street of Laidlaw Transport and the short-lived disposal operation. Hendrie and Company had a small facility behind the brewery. Turn towards H.M.C.S. Haida's berth. It was on your right. Doug, you wouldn't happen to remember where the Bond Shed was before it moved to Gray's Road in Stoney Creek? That would be going back a ways. I know it was on Grays Rd in the mid to late 70s. Yes, but I do it to try and find good spots overlooking highways to take roadside pics from on my trips... I have found a number of very nice spots on there that I would otherwise not have found, especially in southern California. None in Hamilton so far, hehe. Any bond shed I was ever with when at Laidlaw was either Mid-Con, Oakville or Peel in Brampton. A funny story from the Grays road bond shed from years ago. When I was working for Cronin, so late 70s I think, I went in there one day with an in bond container. I was surprised to see one of the younger Cronins, who I never saw outside of the office in Dublin sitting there. I asked if he was out slumming, when he put a finger to his lips in the universal hush sign. He told me a new driver had delivered a can without clearing it first, having no idea what the extra paperwork was for. When the paperwork was turned in, they realized what had happened, and figured the best and most hassle free way to deal with it was for somebody to show up at the bond shed and submit the paperwork, and hope customs did not ask to inspect the load. They probably had a 99% chance of getting away with it, and the risk paid off. Shortly after I got there, the stamped manifest showed up in the basket. But then again, since I was the Broker I knew better. I also knew maybe one day the carrier might reciprocate. As far as hamilton itself was concerned I personally handled very little business there. Several Brokers - Border, IIBC, Peace Bridge and United all had an office there. Air freight for Hamilton clients usually cleared in Toronto. Truck Freight was usually handled by the Midcon folks. The world has changed since those days but yeah, that was the best way to handle that situation. So, here are two pictures of the old terminal on Woodward Ave in Hamilton. Trailer Wizards trailer rental-leasing is in it now. Just wondering who was there before. Hi guys: in response to your quiries I have some knowledge from living in the east end of the city of Hamilton most of my life. Considated /Canadian Freightways was at the corner of Barton & Woodward Ave. They listed Woodward as its address. It was torn down and fenced off , remaining vacant for many a year. It was then purchased by American developers who had a Loewes constructed on the site. Lowes is there today. Walmer Transport , whom was one of the many firms my dad drove for, was on Lottridge Street at the corner of Beach Road. They were the haulers for American Can and did some steel hauling as well. On Woodward there was Conkright Transport yard and further down was Percy's Trailer Rentals, which is now called Trailer Wizards. If you go down to Glow Avenue off of Woodward there were many transport yards there. There was Smith Transport before being bought by CN , Cathcart , Hanson and Leather Cartage. On Brampton avenue ,west of Woodward there was TPT yard and further towards Parkdale Avenue the old Connell Transport . As for Hendrie Transport , after moving from Guise Street , beside Laidlaw, they moved to Brampton and Kenora Avenue north on the bend of the road leading to join Nash Rd. north. On Nash Road was the Finlay Greenwood yard which is now occupied by Apex Transport , which main yard is in Vaughn I think. At the corner of Barton and Parkdale sat the old Consolidated Transport yard when they ran under the orange and black tractors then they merged with Dominon to become Dominion Consolidated. Hope this sheds some light and helps anyone. Trailer Wizard is a branch Provincial Trailer Rentals. Owned by the Hendrie Corp. Hendrie Transport was there until their demise.